. Published on Wednesday, April 4, 2018 . Ballet Folklorico Ollin de Aztlan, Hermanas Unidas, MultiCultural Council, College of Education and Integrative Studies Council, Student Interest Council, Gama Zeta Alpha Fraternity, Greek Council, Cesar Chavez Center Co-Chair for Hispanic Heritage Month and many others including being crowned Mr. CPP in 2010. What do you think is the best thing about ASI? Everything at ASI was like a real company where I learned professionalism, how to run a meeting and run it professionally. I learned how to market my events, manage my own budget and how to collaborate with different departments. What is your best advice for veterans at CPP who are students? We—as veterans— go through a lot through our service and honestly, being involved on campus helps you develop other skills like social networking, how to run different activities and events, professionalism and different aspects of how to run a company….learn to be open to opportunities that CPP offers. I learned how to be a better leader by being open. What do you miss about serving in the military? Actually, I am still serving my country and I have served 17 years so far. 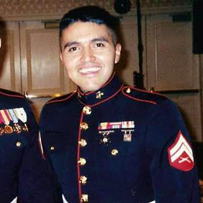 Jose Sanchez stands proudly in uniform. Why did you want to be a part of Student Government? I wanted to be involved in my school and for the betterment of the student body. What do you like about serving? I owe to this country. What did you learn when you were Elections Chair for ASI? 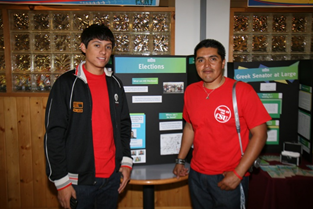 Jose Sanchez, ASI Elections Chair (pictured on the right) at the 2010 ASI Outreach Tour promoting ASI Elections. What professional skills did you learn at ASI that has helped you at your current job? Leadership skills for sure, along with everything I learned as ASI Elections Chair. Time management and collaboration with others has helped me the most. What was the most difficult challenge you faced while at Cal Poly Pomona? Time management. It was hard for me because I wanted to do everything and time management was so hard for me, but it was also the best part, if that makes sense. At Cal Poly Pomona, you need at least at 2.5 GPA to be involved, so I had to keep up or else I could not do what I liked. And that was my motivation—good grades and being involved. What advice do you have for CPP students? Take advantage of the opportunities the university gives to us. Be involved. What has changed about you since you graduated? I feel like the same crazy, young man. The only thing that changed is now I have a real job and responsibilities. What is your most memorable CPP experience? Being Crowned Mr. CPP, especially when I thought I did not have a chance. It was awesome that President Ortiz recognized me and when I graduated Betty Ortiz got up and gave me a hug. And also the VP of Student Affairs, Doug Freer, also stood up and gave me a hug. It was like a thank you for everything I did. I will never forget that. If could change one thing about ASI, what would it be? I would not change anything. Thanks to the format of the company when I was with ASI, the environment and the support was all there for me. What are some words to live by? I do a lot of college advising at my job and give my kids a quote from my previous English teacher, Martha Hoopes, “nobody takes better care of you than the care you take of yourself.” At first it did not click for me, but as I have gone through life, it clicks. I do want to pursue my master’s in student affairs possibly at CSU Fullerton.